From time to time, instruments like this C. Bruno and Son banjo provide one of those special moments here at The Twelfth Fret that remind me why I love this business. To hold in my hands a fully playable, intact and original banjo that is as old as Canada is a thrill that, at my advanced age, cannot be ignored. This C. Bruno and Son banjo arrived here about 15 years ago and has been in storage ever since. As is often the case with my “projects”, it was forgotten for years. I recently came into a lovely set of Ivoroid friction tuners that reminded me of the Bruno banjo and its need for appropriate tuners. This 130-year-old set of friction pegs were typical of the 1880s or 90s. And since they are synthetic ivory, they are legal under the CITES regulations. I fitted and eased the friction peg tuners and completed the setup. Finally this banjo is making music again ! This amazing survivor was hand made in the “first” golden age of banjos. 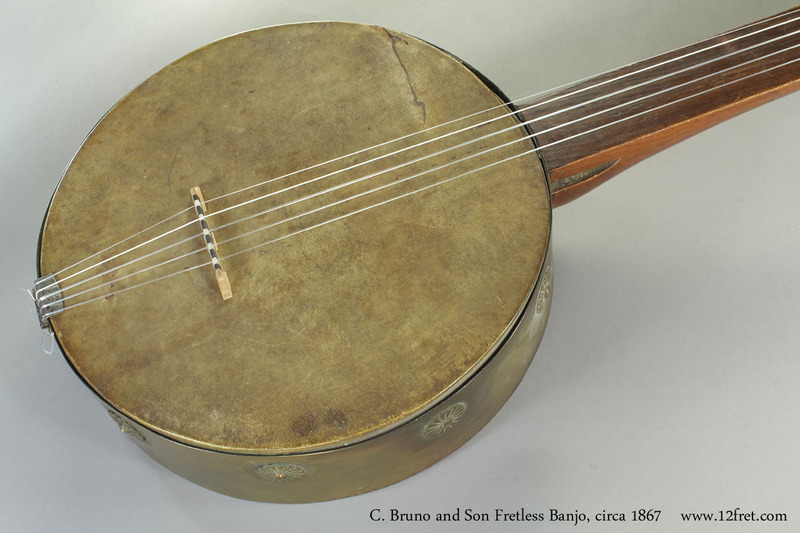 In the time of the American Civil War the banjo began to capture the interest of the public and various makers started to produce them in formal models and offering them at the retail level. There were over 80 different companies that built banjos in the middle to late 1800s !! The variety of tailpieces alone is amazing. Patents were applied for on myriad design features; This Bruno features the “Tilson’s Improvement Patent April 24, 1866”. 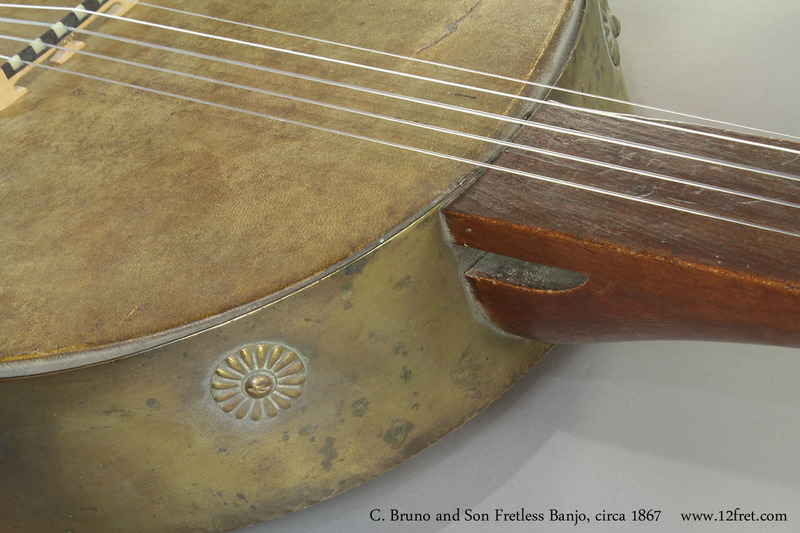 This unique patent covered the head tensioning system; threaded tensioning screws pass through the flesh-hoop part of the banjo and bear against round steel plates inlaid into the wood tone ring. There is even a serial number “3200” clearly stamped into the tone ring ! Charles Bruno immigrated from Germany and established his company in 1834. 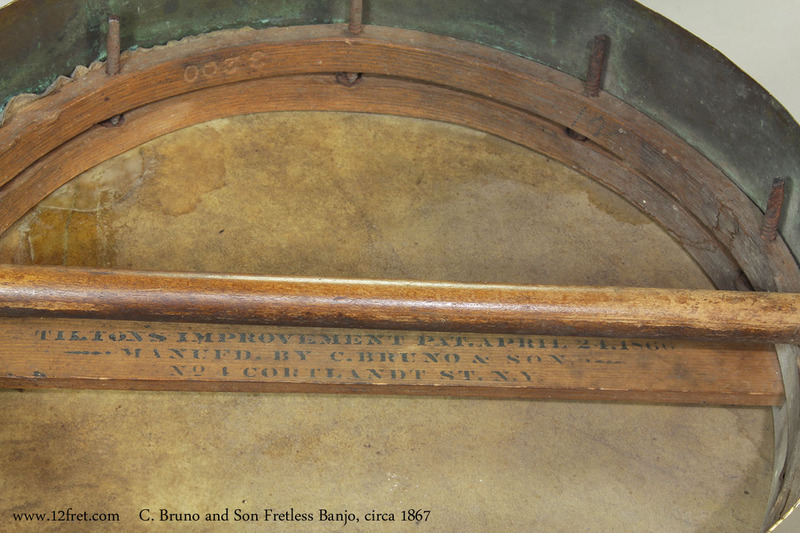 C. Bruno and Son manufactured and imported a huge variety of instruments in New York, continuing well into the 20th Century. They made many models of guitars and banjos. 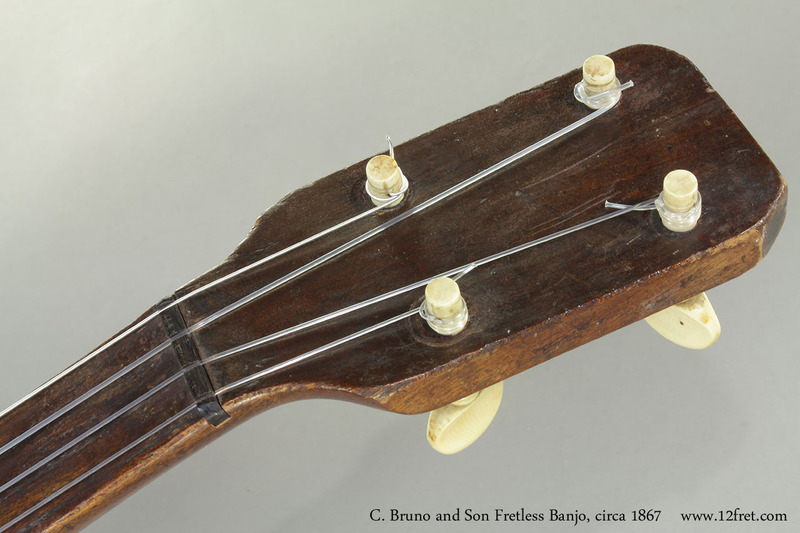 An archived example of his illustrated catalogue circa 1890 shows a fretless banjo: the No. C featuring brass 8″ diameter rim, only 4 brass Shield brackets, Sheepskin head at an incredible price of $1.90 ! 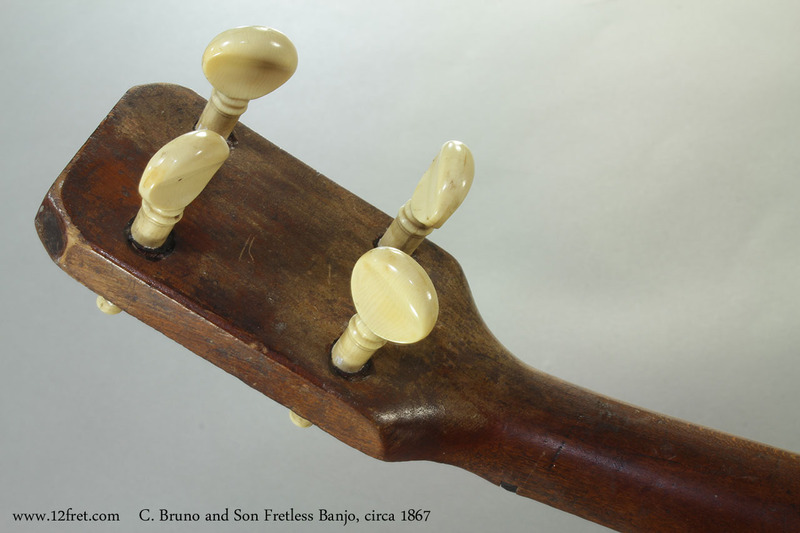 The dowel stick is maple and held in place by the tailpiece mounting bracket: possibly one of the earliest examples of the “dowel stick” system that became standard for most banjos over the next 70 years. The thin spruce support with the Tilson’s Patent and C Bruno label is certainly the earliest example of a fixed second co-ordinator rod that I have seen anywhere. The head may be original but impossible to tell. Having installed hundreds of calfskin heads, this head has a very different pore structure so I feel this is most likely sheepskin as was often used in the 19th century. Neck: The one piece fretless neck is carved out of one, very evenly grained and light weight piece of hardwood. I am struggling to identify the wood species as the dark finish obscures much of the wood, but I am going to call it “maple” with a very heavy patina. I’ve restrung the Bruno with modern nylon “gut” strings. Ideally I should restring with a set of historically accurate gut strings made from sheep-gut in the traditional way…and I’ve dutifully add this to my to-do list. The banjo plays beautifully and I can only imagine what stories it could tell of the musicians who have played this incredible banjo over the past 148 years. Note: this feature jogged the memory of the man who sold us the banjo many years ago. Apparently, the banjo spent much or all of its life in Canada. It came from an elderly gent by the name of Mike Madden who sold instruments in a local Flea Market. He passed away long ago but he was quite a interesting character. He would have picked it up in the historic Prescott/Brockville area.